In this myth-busting book, the authors reveal that great business ideas do not spring from innate creativity, or necessarily from the brilliant minds of people. Rather, great ideas come to those who are in the habit of looking for great ideas all around them, all the time. Too often, people fall into the trap of thinking that the only worthwhile idea is a thoroughly original one. Idea Hunters know better. They understand that valuable ideas are already out there, waiting to be found - and not just in the usual places. Walt Disney dreamed of creating a family theme park that would be significantly different from the seedy amusement parks of the era with their bad food and surly employees. While on vacation in Copenhagen, Disney discovered Tivoli Gardens, a calm, clean amusement park with flowers, tame rides and a joyous family atmosphere. He immediately began taking scores of notes and, a few years later, the innovative Disneyland park opened in California. This story is told in the opening chapter of The Idea Hunter, written by Andy Boynton and Bill Fischer with William Bole. In this intriguing book, the authors argue that creative ideas are not imagined, they are found — they don't emerge from the brilliant minds of innately creative people, but rather, they already exist in the world and only need to be discovered. How, then, does one go about becoming "idea-active"? 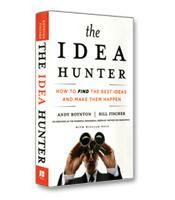 The answer, according to the authors, lies in the acronym IDEA, which summarizes the four core principles of idea hunting. The first principle is to be interested in the world around you. "Those who excel at the Hunt understand that almost anyone can hand them an incredible idea, which they are generally free to use," write the authors. In 1912, Clarence Birdseye set out on a four-year fur trading expedition in Canada, during which he noticed that the locals kept meat and vegetables fresh and tasty by burying them in the snow for conservation. Birdseye's interest in the practice would lead to the creation of the frozen foods industry. The second principle is diversification, to recognize that parts of a single idea can come from many places. To invent the phonograph, Thomas Edison and his engineers blended ideas from products that they had developed for the telegraph, telephone and electric motor industries. 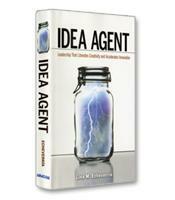 The fourth principle is, as the authors write, "the need to be agile in your handling of ideas." An idea rarely comes fully constructed and packaged, ready to be taken to market. W.L. Gore engineer Dave Myers's path to developing Gore's guitar strings, for example, was a sinuous one. An avid mountain biker, Myers was working on a coating for artificial arteries when he adapted the material to bicycle gear cables for a smoother shift. For the bicycle research, Myers had used guitar strings as a prototype, and instead of throwing the strings out, he asked some amateur guitar players whether they might want them. As it turns out, the strings not only felt smooth to the touch, they kept their tone longer than conventional strings. Thus, a new market-leading product was born. The Idea Hunter is filled with stories, from the well-known to the unfamiliar, as well as guidelines and advice to help readers apply the authors' principles and methodology. Boynton, Dean of the Carroll School of Management at Boston College and a former professor at the International Institute for Management Development (IMD) in Switzerland, and Fischer, a professor at IMD, have offered a valuable blueprint to any manager or entrepreneur who is looking for the next big idea.